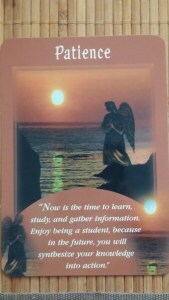 Diana P. " Messages from our Angels"
A little more about this card: Although you may be aching to begin a new project, now is not the time. You are in the vital phase of gathering right now. This means that you’re acquiring new information through studying, reading, meditating, channeling, taking classes, interviewing experts, and other means. In all of life, there is a time for gathering and a time for planting.